Last week, we took a week off of tot school because Henry just wanted to be outside enjoying the newly warm weather -- and quite frankly, so did I! But this week, we were back in action learning about the letter L. It was a fun week! 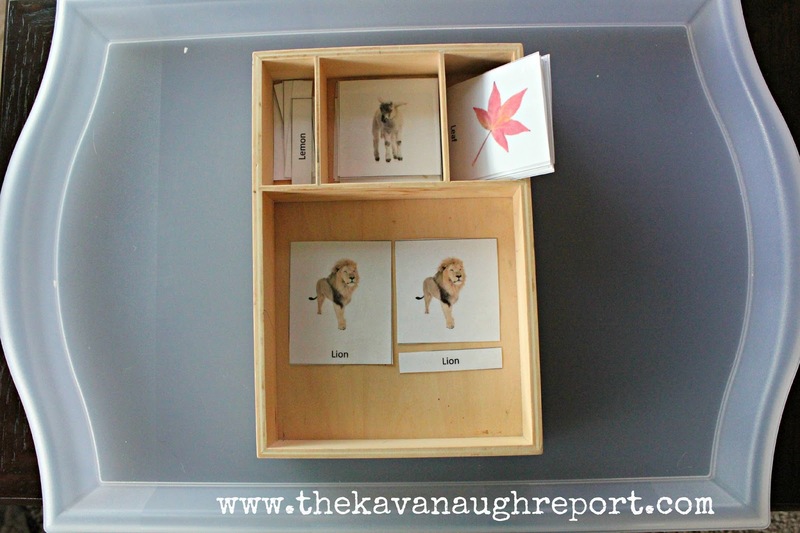 Prior to starting Henry could identify and say L but he struggled with the lower case l.
On the first tray was a set of Montessori 3-part L word cards that I made. I found this awesome tray at Goodwill and it was perfect for organizing the tray. Henry enjoyed sorting the cards much more than he wanted to match them. He must be coming out of his sensitive period for matching, because a few weeks ago he would have loved this, now he largely ignored the tray. The second tray was by far Henry's favorite of the week. 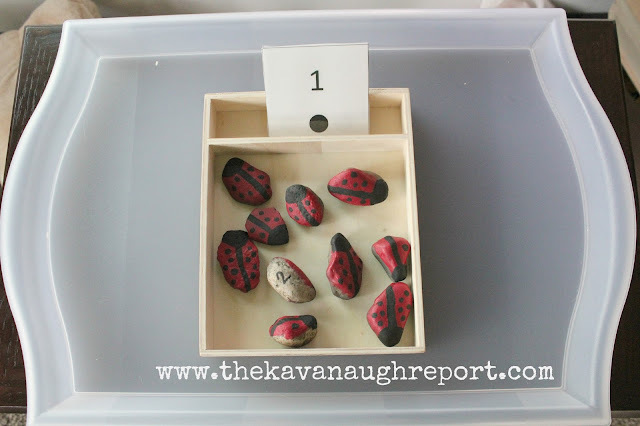 I painted 10 rocks to look like ladybugs. Each ladybug had a different number of spots on it from 1 to 10. Then, to make the activity self-correcting, I wrote the number of spots each ladybug had on the bottom of the rock. Finally, I made matching laminated cards that contained the numbers 1 to 10 and the corresponding number of black dots. Henry is obsessed with rocks and numbers right now so this activity was perfect. He sat and matched the ladybugs to the cards for up to an hour at a time. Over and over. Most of the time he looked at the written number, but he got the job done. And, he was so darn proud when he got them right! The final tray was a lacing activity. 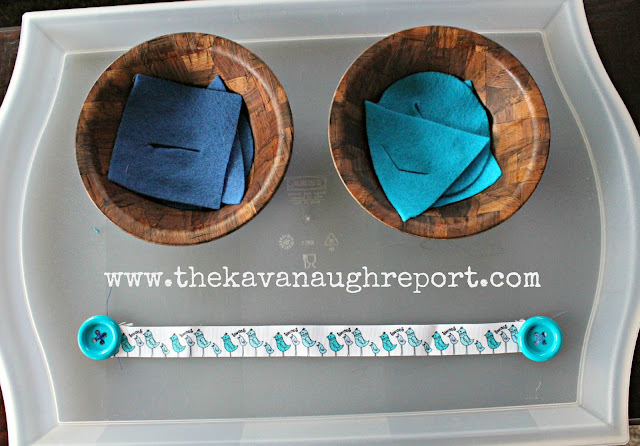 I made this button snake and the felt shapes way back for the color blue tot school week. I can see now that at the time I first introduced it, Henry was WAY to young. Even now he struggled, mostly from lack of interest. Henry seems to have no desire to learn any self-care, which extended to learning the buttons. He did enjoy taking the felt off if I put the felt on. We also had a letter L sensory bin. After a couple weeks of lame uninteresting bins, the letter L finally had some good options. 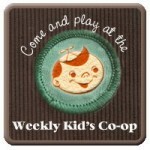 Henry loved playing with the lions, the lizards, and the fabric leaves. Other things we did this week included: These were a little more sparse than usual, just because Henry didn't want to come inside! I'm going to have to start planning more outdoor activities. I LOVE the rocks/ladybugs! I really enjoyed seeing his excited faces :) It's funny, because my little guy loves the button snake I made him (and also loves the baseballs on the ribbon lol). But I'm sure he will eventually move on to something else that he will prefer much more! Great week! I agree! The ladybug rocks are adorable! I like your school area, too. I love those lady bug rocks too! He was so proud of himself. Following you from Sun Scholars. What a great unit! I love the lady bug rocks! 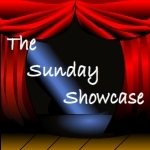 Thanks for linking up at the Virtual Sharing Fair! Win $100 Home Depot Gift Card! !